To help you plan your visit we have listed some of the beautiful places in North Devon you may wish to visit while you are here in Croyde. Croyde is a small and beautiful village on the coast of North Devon. Famous for its surf and sandy beach it is the ideal place to stay for surfers, couples and families.Croyde is ideally situated to explore North Devon. Only a half an hour drive away you will find yourself on rural Exmoor or if you prefer a spot of shopping Barnstaple is only 20 minutes away. Whatever you are looking for while on holiday Croyde and North Devon will exceed all your expectations! We have some fantastic beaches in North Devon so suit all beach goers! 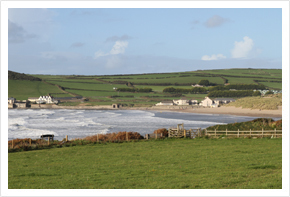 Here at Croyde Beach we have a fantastic beach which is famous for its surfing. It is also ideal for families and sunbathers! Just around the corner is Saunton Sands Beach which is a 3 mile long beach with its famous sand dunes. Or alternatively why not head to Woolacombe’s award winning beach and enjoy great surf or a family day out. Exmoor National park is only a half an hour drive from Croyde and it is must place to visit on your stay with us. 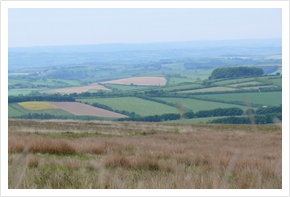 Exmoor has Stunning landscapes, wilderness and tranquillity which is unique to southern England. Whether you are planning to visit the National Park to walk and relax or to to participate in the array of activities that can be done check out the Exmoor National Park Website. In North Devon we have some exceptional golf courses. Saunton Golf Club is only a 2 minute car drive from us and is home to two great mature links Championship golf courses. Other great courses in North Devon include the oldest Golf course in England The Royal North Devon Golf Club or the plush Highbullen golf course. Or why not try surfing? 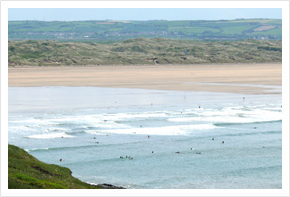 Croyde beach is only a stones throw away and Surf South West offers surf lesson to all. 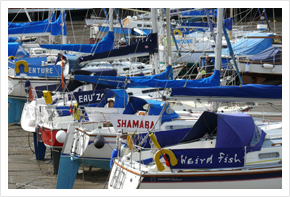 There is so many attractions for all the family in North Devon. For families we have attractions such as The Big Sheep or the Milky Way, both are all weather attractions. Alternatively, we have plenty of animal oriented attractions such as Exmoor Zoo, Combe Martin Wildlife Park or Quince Honey Farm. If you fancy something more historic why not visit Cobbaton Combat Collection or take a trip to the beautiful and unspoiled Lundy Island.